Being a mama, I understand the importance of simplicity, purity and natural ingredients for myself and my family. At Terrasoul, we value community and sustainability, which is why we wildcraft and use local sources & organic products whenever possible. Our products do not contain harmful or unnatural ingredients. There is an ancient sacredness to be found in a relationship with the natural world, that is experienced and tended on a daily basis. 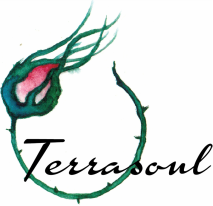 At Terrasoul, we desire to create everyday opportunities to re-connect with the Earth and her gifts through our products and ceremonies. In brewing a fresh pot of tea, lathering on some nourishing herbal body cream or partaking in one of our sacred ceremonies, a re-connection is being made to the great song and heartbeat of the Great Mother to us all; one that we hope will brighten, invigorate, bring peace & heal.